How many year have I been beating this drum? There is no doubt Canada’s high immigration rates have a major impact on housing affordability in Vancouver, Toronto and Montreal, according to a new study. “First and foremost, immigration policy is, essentially, also a form of housing policy,” University of B.C. geographer Daniel Hiebert says in a comprehensive paper published in the winter edition of the Canadian Journal of Urban Research. “Metropolitan housing in Canada would, very likely, look totally different if the scale of immigration were to change dramatically in either direction. The recent decision to raise permanent immigration admission levels from approximately 270,000 in 2015 to 340,000 in 2020 will surely have a significant impact,” Hiebert said. Most immigrants show greater determination than Canadian-born citizens to buy housing in Canada’s three major cities, said Hiebert, who also studied buying and renting patterns along ethnic lines. The elevated home-ownership rate among ethnic Chinese immigrants in the expensive cities of Vancouver and Toronto is “striking,” Hiebert said. “The rate of home ownership among individuals declaring Chinese origins is exceptionally high for newcomers: Over seven in 10 of those who arrived in Canada between 2006 and 2011 reside in households that own a home,” he said. The discovery that most new Chinese immigrants can afford to buy housing within a few years of arriving in Canada — at a rate higher than the overall Vancouver average of 69 per cent — supports numerous reports that have indicated many new immigrants from East Asia are making their purchases with large amounts of capital earned in their homelands. The peer-reviewed study by Hiebert, who frequently advises the federal government, enhances earlier research by UBC geographer David Ley, as well as the Conference Board of Canada, that has shown a strong correlation between rapid immigration and pricey housing in Metro Vancouver and Toronto. Hiebert’s analysis of decades of Statistics Canada data confirmed two contrasting narratives about immigrants and housing — that well-off immigrants are increasing housing prices in Canada’s major cities, at the same time lower-income immigrants are struggling to pay for shelter. The trend that sees most immigrants moving rapidly into home ownership “undoubtedly has had an impact on the escalation in the price of housing in Toronto and Vancouver and has brought a sense of vibrancy to those markets,” Hiebert said. Broadly speaking, however, Hiebert’s research magnifies ongoing anxiety about rising housing costs for residents of Metro Vancouver, which Demographia ranks among the three most unaffordable cities out of more than 400 surveyed in Europe, North America and Asia. When analyzing buying trends by ethnicity, Hiebert found that Caucasians in Metro Vancouver had an average home ownership rate of 67 per cent, which is lower than the visible-minority ownership rate of 72 per cent. The city’s two largest visible-minority groups are the most likely to own homes in Metro Vancouver and Toronto. More than 81 per cent of ethnic Chinese in Metro Vancouver, a total of 233,000 adults, live in owned homes. The proportion for South Asians is 75 per cent, with more than 121,000 South Asians over age 18 living in owned households. Filipinos and South Koreans in Vancouver had modest home ownership rates of 61 per cent, while Latin Americans and blacks were at 46 per cent. Arabs, a small group, were lowest at 37 per cent. The groups facing the most financial difficulties in securing housing in Canada’s three major cities are Koreans, West Asians (mostly Iranians) and Arabs, many of whom are in “precarious” rental situations. Lol it took such a in-depth study to observe the obvious? If it was cheap credit and low interest rates / speculation that caused the hosing price increase you would have seen bubbles formed all across Canada. The interest rate is set federally and the money supply can flow freely across the provinces. But you need to look at the demographics. Everyone thinks that all immigrants are just un educated rich corrupt Chinese business men here to launder their money. Though I don’t deny there is cases exist. The immigration process to Canada is actually quite rigorous. Post secondary education, professional work experience and medical screening are just some of the hurdles one must comply with to come to Canada. To help make sense of the current housing prices you need to understand Asian culture and mentality. 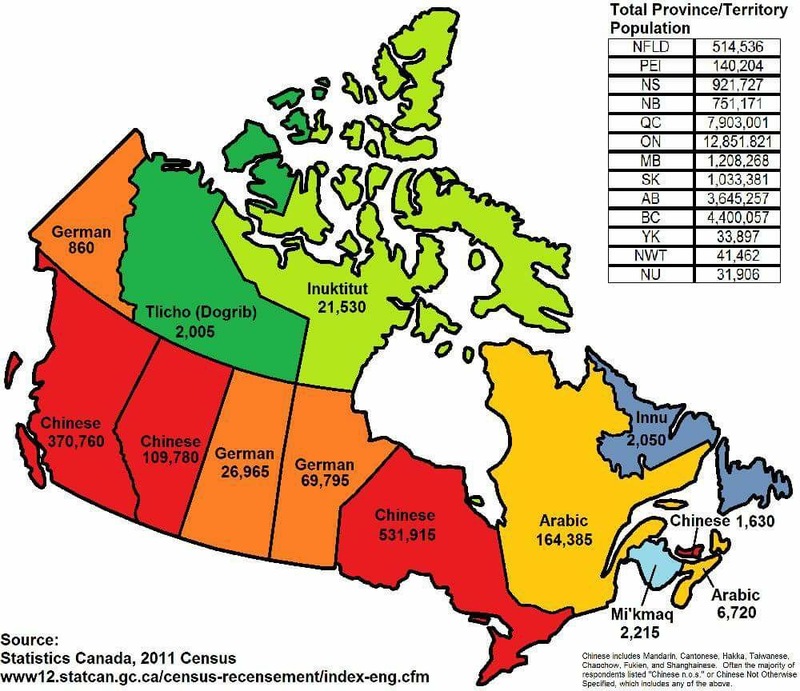 Look at picture I attached from stats-can. 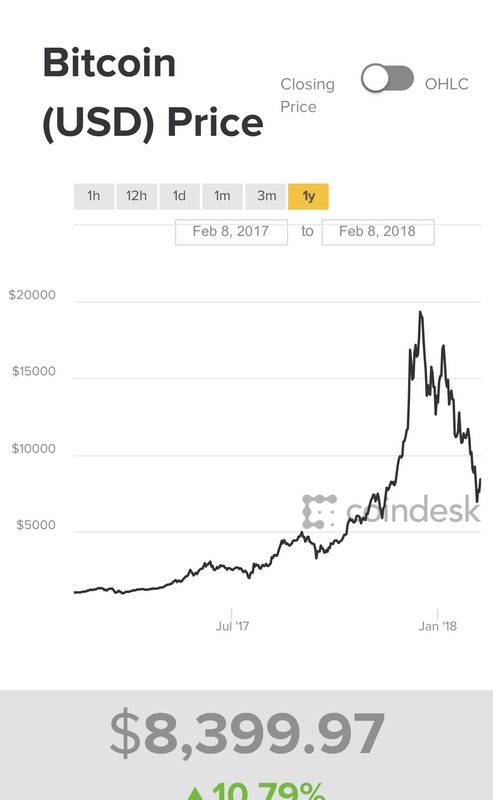 Bitcoin is a bubble, and the recent 20% correction already showed that. You can get in cheap and speculate. You can’t do that with Vancouver real estate. You can’t show up with zero down and gamble. I don’t know what will happen in the future, it may go up or it may go down. All I can say is the real losers are the people who held out from buying because they thought they were so smart to try and time the market. This is called the dead zone now, the market is moving sideways... not going up or down, a state of limbo. People who bought can enjoy their homes and pay down their mortgage. Renters are stressing out with no certainty... its been 10 years since 2008... time in life that has been wasted not building equity or moving forward in life. Canada is brining in 1,000,000 - that’s 1 million new immigrants in the next 3 years. Again, I’m not sure where prices are going but.... 1 million. Immigration is only a quarter of the puzzle. The majority of the puzzle has to do with the class of immigrants coming here and their ability to circumvent our laws. Bitcoin is here to stay - those that think otherwise will miss an opportunity as big as buying Vancouver RE in 2005. And probably be crying bubble the entire time. Bitcoin uses block chain technology, bitcoin just happens to be the most popular "brand" of crypto currency. There are hundreds of them, none of them have any official backing other then investor confidence. Korea already taking steps to ban exchanges... I always believed that Bitcoin will be crushed not by the bubble bursting but regulation from the government. Why would uncle Sam let people get away with all this money circulation without getting their %. Probably how the whole bitcoin craze gets fizzled out is US and A will come in outlaw all crypto currencies and use the block chain and issue their own. https://en.wikipedia.org/wiki/Gold_Reserve_Act - In 1934 Franklin D. Roosevelt outlawed all gold in possession by private citizens and the treasury took all of it. Not hard to believe the same thing can happen to bitcoin. BTW though I don't believe the long term existence of bitcoin (not block chain) savvy investors have made a nice return. You gamble big, you win big. Cudos to investors who saw bitcoin as a investment. I've been tracking it since it was $400 and I can say I missed out. No man, immigration is 90% of the puzzle. That's why I'm confident there can be no sustained downturn in the Vacouver and Toronto markets. We are the 2 top destinations for over 300,000 immigrants per year. If immigration policy changes then I'll change my position. Wow you guys are so smart with your investments, I especially love the risk management! All this is hindsight and speculation on the reason behind the price movement. To sum up the driving force into 1 variable such as immigration is grossly oversimplified. Everyone is a genius in these forums lol. By the way bitcoin is going through a correction or what you may call consolidation.t This happens after every big price move. It's still a bullish chart from a long term perspective, as mentioned, corrections like these are normal in highly volatile markets like bitcoin. I'm surprised you're not used to this as you seem to know a lot about everything. This is extremely common for new sectors. Just look at the MJ market, this is nothing compared to MJ. But MJ is still extremely bullish. If what happened to Bitcoin in the past few months is not considered a bubble... well then I guess you believe the earth is flat. Sounds like you got tangled up in Bitcoin and now trying to defend your position. Bitcoin is suppose to be a alternative to cash, but that proved to fail. High transaction cost, long processing times. All people are using Bitcoin now is speculation. Traditional stocks mike MJ actually produce something. And what chart on earth are you using to indicate that Bitcoin is long term bullish, I would love to take a look at your technical analysis, because every indication points to a downward trend. Applying Fibonacci retrenchment already blew by all 3 marks. So I guess long term bullish means you’re praying in your gut. There are thousands of crypto currencies in circulation. Who decided that Bitcoin is the official one. Even Goldman Sachs today and came out and said its all going to zero. Last edited by yzfr1 on Thu Feb 08, 2018 9:22 am, edited 1 time in total. Last edited by yzfr1 on Mon Aug 20, 2018 10:01 am, edited 1 time in total. Sure I'll entertain this a bit, let's back track.You said BTC is in a bubble, and I did not dispute that. 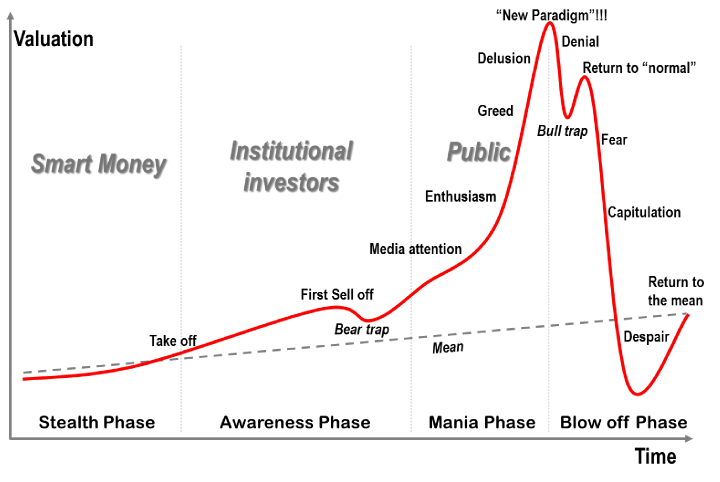 Anything that goes Parabolic is in a bubble and will have a HIGH PROBABILITY of a sharp correction. Deep corrections happen all the time in new sectors, including BTC. You can find similarities in the MJ sector which is a new market like the BTC. Deep pullbacks (deep corrections) but markets will impulse and make new highs after the correction. - I'll show you some parallels with the MJ Market. Look at the deep pullback below with WEED.TO last year's pullback from 18 dollars to 8 dollars. It bubble up and the bubble corrected. Look at it now, just last month it hit 44 dollars. It bubbled up again in a much larger magnitude and it corrected from 44 to 20. Bubbles happen in new sectors and corrections follow. This is conservative for a marijuana stock by the way. You can look at all the others and you will observe higher proportional gains and more extreme corrections. I will say it one more time deep corrections are normal for new sectors. That is to say THERE IS A HIGH PROBABILITY OF DEEP PULLBACKS IN NEW MARKET SECTORS THAT HAVE GONE PARABOLIC. Notice I'm using the words "probability" and "normal". As in I can never be 100% sure, but the price movement is within the probabilistic norm of new sectors. I can honestly say I'm not in BTC, I don't even have an account verification has been pending for a month. When I say flag, i mean the structure in the picture below.The reason being it has a higher probability of continuing the up trade once it breaks this structure. You mentioned Fib retracement.. You should know that Fibonacci as in Fibonacci Retracement has no statistical edge. What has a statistical edge are pullbacks of 50% to 60% magnitude are more likely than other pullbacks.I don't quite understand what you mean by 3 marks, but even if you apply Fib retracement to BTCUSD you still see a normal retracement. For TA to be implemented properly must be quantified statistically and statistics deal with probabilities. If you understand probabilities then you know there is no such thing as a guaranteed trade and you wouldn't be so caught up in being right or wrong with sematics. If your method has a 50% chance of winning, your Reward/Risk ratio MUST to be greater than 1 to make money over the long run. If your method only has a 25% chance of winning, if you're reward/risk ratio MUST be greater than 3 to make money over the long run. This shows that you do not need to be right more than half the time to make money, MORE IMPORTANTLY just because one is right 90% of the time, it does not mean they will make money. Trading or using TA is not about being right or wrong. It's about taking calculated risks and knowing that it will work at times and at times it will not - rules of probability. I don't believe you know how to trade or use TA the way it's intended. You're more concerned about being right or proving a point than actually having a method with a STATISTICAL edge and following it. It's like you are trying really hard to be right and sound smart, you just need to relax and understand that nothing is 100%, we live in a world of probabilities and markets are no different. If you don't understand that then you don't understand TA at a fundamental level. You also speak of Goldman Sachs and link these news like it's an indicator of where the market is going. You should know better to not follow recommendations and news for investing. You will be more successful fading news than following it like sheep. How come none of your charts have high/low open close prices, do you just look at the close price? While the close is important, it's only 25% of the information. You really need the open/close high and low prices to even start TA. Given your posts has the following. There is a high probability that you do not know how to trade or use TA. You are a long term investor and you should stick with that until you have a system with a statistical edge. Immigration is not the only factor in Vancouver's fantastic real estate market. The main factor is that it is awash in illicit capital. Immigration is great for Canada and educated and rich immigrants are the best kind. Criminals looking to wash and hide money here is the real concern. Vanbullbear looks like feelings were hurt during the creation of this post.
" but markets will impulse and make new highs after the correction. " based on what? this is my main point ive been trying to get across to you. Why does bitcoin need to reach new heights after each correction? Are they coming up with new technologies, new products or merging to bring in new wealth? There are no fundamental backings ... its a pure pump and dump at the moment. There is no value or purpose to Bitcoin. I mentioned Fib's because you said it was bullish, when a stock retrenches like that it indicates a change in direction. I used that as a quick indicator to show you the market has moved from a upward trend to a downward trend when you claimed it was "bullish".